Last week, the Los Angeles Times reported on a “poll” by Hart Research purporting to show widespread labor law violations in the restaurant industry. The dubious survey was commissioned by the SEIU-backed worker center “Low Pay Is Not OK,” a national umbrella front group for SEIU’s other “worker organizing committees.” Hart is a big-time union pollster, receiving over $1.2 million from labor unions in FY 13 Department of Labor reports, including over $370,000 from SEIU. In other words, the Times failed to properly inform readers of the survey limitations. In addition, neither the Times nor Wemple noted that the SEIU was likely the ultimate sponsor of the survey, allowing the union to hide behind its “worker center” front group. 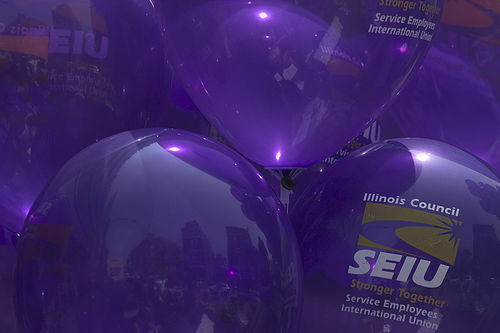 The SEIU has poured millions of dollars into the groups making up the national corporate campaign to unionize fast food restaurants and win a self-interested minimum wage increase. The SEIU continues working toward a national card-check for restaurant workers, something it has sought since the days of the card-check bill. If Congress does not step in and pass legislation like the Employee Rights Act that will protect workers’ rights to a secret ballot on whether to unionize, expect labor unions—especially the SEIU, one local of which has been caught palling around with apologists for the leftist Venezuelan regime’s crackdown on dissent—to continue their schemes to corral employees to join against their will under intimidation.